Introducing the Shrimpy Index Tool. This free indexing feature will provide the most powerful way to index the cryptocurrency market. The index will automatically buy and sell assets on your favorite exchange in order to construct the index of your choice. Why Use Shrimpy To Index? In Shrimpy, we don’t restrict you to a few select indexes. You get infinite options to configure the index that works for you. Select any number of assets for your index. Allocate based on market cap or an even distribution. Set a maximum percent allocation per asset. Fix a minimum percent allocation per asset. Exclude assets your index should ignore. Pick a rebalance period that works for your strategy. In order to better understand how each of these configurations work, let’s go through a few examples of indexes we can build in the Shrimpy application. First, we should look at the most traditional style of index fund. 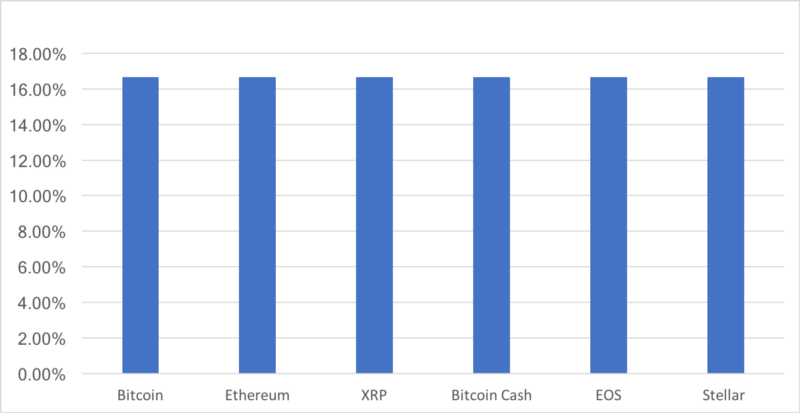 An index which allocates the top ten cryptocurrencies weighted by market cap. 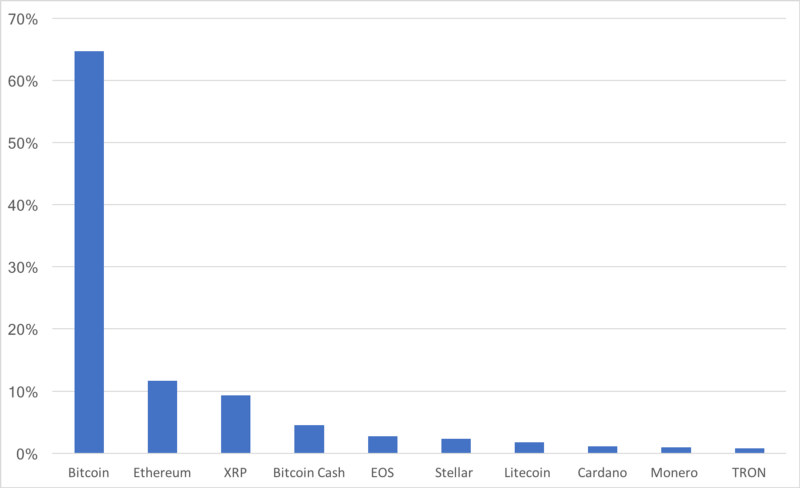 This is an index of the top ten cryptocurrencies, weighted by market cap. USDT was excluded because it is tethered to a fiat currency. Looking at this index, it is clear that the overall performance of this fund will heavily rely on the performance of Bitcoin. As a result, you may decide that you want to reduce the reliance on Bitcoin by putting a cap on the percent allocation allowed by any one asset. For the sake of this example, let’s say we want a maximum percent allocation of 20%. Shrimpy allows you to easily solve this problem by entering a minimum and maximum percent allocations. This will prevent any asset from maintaining a target allocation greater than the maximum percent allocation and from achieving a target allocation less than the minimum percent allocation. The max and min percentages that you chose are completely up to you. In addition to setting a minimum and maximum percentage, let’s pretend you read our article on diversity, and this led you to wanting a more diverse portfolio. Once again, you can do this with Shrimpy. All you need to do is input the number of assets you would like to hold in your index. If you wanted 26 assets, simply input 26. 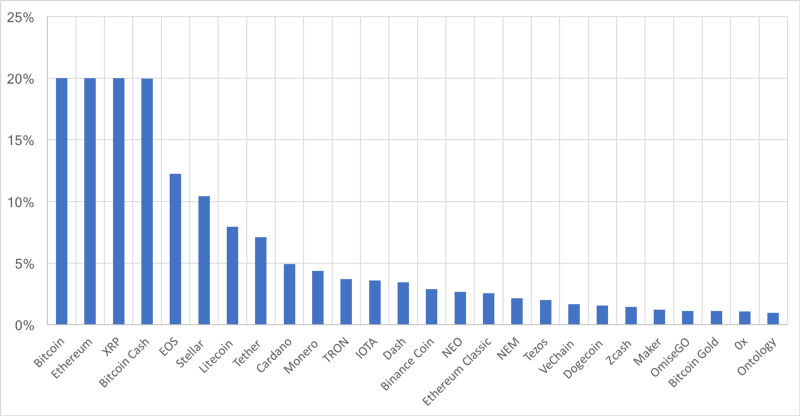 This is an index of the top 26 cryptocurrencies, weighted by market cap. The maximum allocation for any asset is capped at 20%. We can quickly see this is becoming a powerful tool for numerous use cases. After allocating such a beautiful portfolio of 26 assets, let’s say you changed your mind. You decided you only want to allocate the top 6 cryptocurrencies. Additionally, maybe you read our article about optimizing asset distribution and determined that an evenly allocated portfolio would be a better strategy. Shrimpy allows you to instantly change your strategy and implement this new index within seconds. It’s the easiest thing you will do in the crypto space. Let’s take a look at what the resulting allocations would be in Shrimpy. Top 6 assets weighted evenly. Now that your portfolio has been allocation, you may be wondering how much maintenance is required. Shrimpy automatically adds and removes the assets from your allocations as they come in and out of the rank you designated. If you selected to hold the top 5 assets by market cap, then you will always have the top 5, even when the market moves and the rankings change. Everyone knows us for our rebalancing, so you might be asking yourself “Ok, but does it rebalance”. Of course it rebalances. Select any rebalance period. Anywhere from every 1 hour to every million years. You have the freedom to select your rebalance period. You can also rebalance instantly at any time by clicking the “Rebalance Now” button on the dashboard. Shrimpy is pioneering the way for crypto indexing. Without buying an index fund, you can get exposure to the most powerful indexes by maintaining the underlying assets on Shrimpy and indexing through the Shrimpy Index Tool. We aren’t done with indexing though. There are more features and capabilities that will be coming to our users on the Shrimpy application. As we explore indexing options, we will continue rolling out new ways to manage your portfolio.